Balayage is a French word, which literally means “to paint or to sweep”. It’s also the name of a popular hair coloring trend. It includes painting highlights into your hair. It's an entirely freehanded technique, which allows more creativity and customization. Balayage works well with all hair length and all-natural hair color blond, brunette, black or even grey. It looks amazing on straight or curly hair, but it's sexier on curly hair. 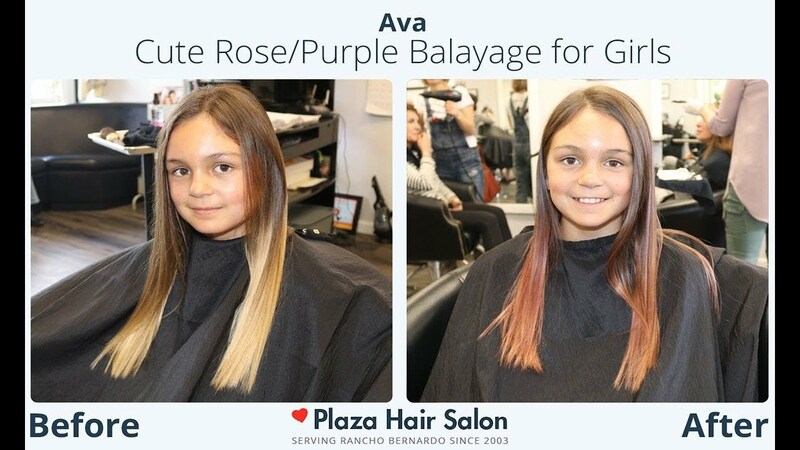 While most women try this style for a natural sun-kissed hair and a more natural look, young girls can choose intense new colors like pink, violet, blue, green. You can be creative, original and playful. Both you and your hairstylist can express your creativity and play with colors, shades to create a unique hair color which fits your personality. It can be girly and romantic like the colors of a beautiful flower (lavender, lilac, rose, fuchsia) or intense and vibrant (amethyst, pink, grape, violet). Brave girls can try electric combinations like black with pink highlights or blue shades. You can choose any color, shade you like to express yourself. This technique allows creating your own look. Also goes for lazy girls, sporty girls or beach girls who prefer a natural sun-kissed relaxed look and don’t like to spend much time in front of a mirror. Dare to be original and creative but also ask for your hairstylist’s opinion who can give you any advice you need. Balayage can be done at home also but it’s not suggested. With no experience, the results can be not the ones you were looking for. The first step should be finding an experienced creative hairstylist, who will use quality products. Here at the Plaza Hair Salon, our hairstylists will help you to choose the best colors for your personality and style. We can also help you to find the best colors for your skin tone and for your haircut. How Long Will it Take the Whole Process? When Does it Need to be Redone? The durability of the color and time depends on how intense the balayage is. Usually, it takes about 8-12 weeks until you need to go visit your hairstylist again. Between two balayage you need to use a special shampoo once a week to keep the colors fresh and shiny. How Long Do You Have to Wait to Wash Your Hair After Balayage? Our hair stylist’s suggestion is to wait three days after the coloring. The cuticle layer needs about 72 hours to close fully and this traps the color molecules and the result is a longer lasting hair color. Get Your Super Colorful Balayage at Plaza Hair Salon! So, are you decided to choose the A-listed stars and supermodel’s favorite coloring style? Did you choose the color? If yes, we are waiting for you to call for an appointment. Call us now at 858.485.7551 or email us at appointment@plazahairsalon.com for an appointment and our hair stylists will give you all the information you need about the keratin treatment options. We also welcome walk-ins!